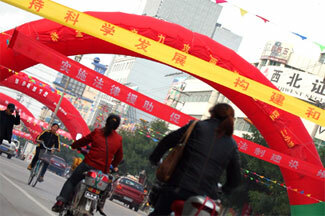 The main streets in town have been strung with banners of colorful cloth flags. Massive inflatable archways have been erected over the road. A cleaning crew is out in full force. The buzz is palpable. Tomorrow there will be a major inspection of Guyuan Yi Zhong by the Ningxia Hui Education Bureau officials. Timing has been secretive for the last few days - will they show up today? or tomorrow? Finally we know. I was fitted for a new school uniform by a local tailor just a few days ago. Myself and the 400+ other teachers will be modeling them. In tight formation. The school grounds are still a mess however, the main gate to the school is a mudpit. Workers have been working around the clock. 24 hours a day to get it paved in brick. The weather hasn’t cooperated however - and I feel somebody might take the fall for it. Where will the teachers stand? Where will the students march? Where will the officials park? I hope the klieg lights across the wall mean the gate will be finished early tomorrow AM.